Despite all of the tools that are brought to bear in the War on Spam, spammers continue to ply their trade successfully. The most prolific reach millions upon millions of people and are adept at adjusting to new weapons that aim to shut them down. The truth is that defeating spam doesn’t require more technology but changes in human nature. Here are 10 common sense ways to avoid spam that are forgotten or overlooked far more often than we’d like to believe. Use a spam filter. It should go without saying that one of the best ways to avoid spam email is to use a spam filter. But not everyone does. On the desktop, many popular internet anti-virus/security programs come with spam filters. On the server, an open source solution like SpamAssassin can kill spam without costing you an arm and a leg. Don’t broadcast your email address. If your email address is published on the public internet, chances are spam will soon follow. While it may be impossible to keep others from posting your email address online, make sure you’re not revealing it yourself on your website (use a form instead — see below), social networks, public directories, etc. Use different emails accounts. The hassle of spam can often be minimized by using different email addresses. While you probably already have two accounts – one for work and one for play – consider that it may be wise to keep a few throwaways around. This is especially advisable when signing up for email newsletters, participating in contests or when purchasing from retailers you’re not so familiar with. Turn off read receipts and images. If your email client supports read receipts and the display of images embedded in emails, turn them off. These are a great way for spammers to detect when they’ve reached a live one. Be careful about unsubscribing. Unless you know you signed up to receive emails from a particular source, exercise caution with unsubscribes. Oftentimes, spammers provide a fake link to an unsubscribe page that merely indicates to them that your email address is worth sending even more spam to. Mind the CC. If you’re like me, you hate being CC’d unnecessarily, especially on chain emails. The chances that a person receiving an email with a mailing list’s worth of CC’d recipients will eventually be infected with a virus or trojan that is used to spam are pretty high so do your part to minimize the risk by thinking twice before CC’ing everyone you’ve met since 1995. Use forms. If you solicit contact from the web, don’t post email addresses — use forms instead. Embrace the CAPTCHA. Forms aren’t perfect and spammers are often just as adept at using forms to deliver their payloads. By employing CAPTCHAs, you can often significantly reduce the amount of spam that is received through forms. Secure your site. If you’re not paying attention to your site’s security, you should. Many sites are hacked for the sole purpose of spreading spam and malicious software. By paying attention to security (e.g. making sure you’re dealing with user input, staying patched, hardening your server, etc.) you can minimize the chances that you’ll become a delicious target for spammers. Catch a spider. For those who want to defeat “bad” web spiders/crawlers, there are a number of spider trap techniques that can be used. Photo credit: dok1 via Flickr. Every two years, SEO consultancy and publisher SEOmoz publishes a Search Engine Ranking Factors report that details which ranking factors some of the world’s top SEOs think are hot and not. The latest Search Engine Ranking Factors report was published in August. 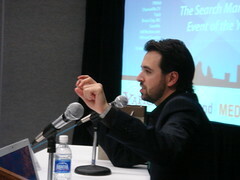 I spoke with Rand Fishkin, CEO of SEOmoz, about the 2009 Ranking Factors report, the dilemma of paid links and how social media is changing SEO. Yahoo’s new $100m advertising campaign has launched. It’s multichannel and combines television, print, radio and digital. Online, chances are you’ve already come across some of Yahoo’s ads. They’re on a variety of popular websites and in many cases, they’re very visible.